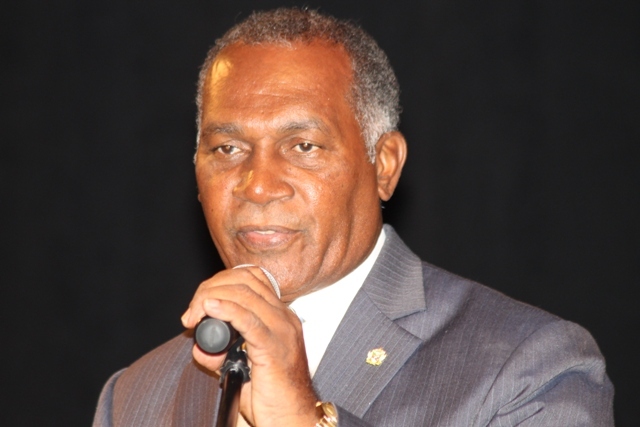 NIA CHARLESTOWN NEVIS (SEPTEMBER 25, 2015) — Premier of Nevis and Minister of Finance Hon. Vance Amory, called on parents to help their children to develop a love for agriculture as it provides a viable avenue for employment when he delivered the keynote address at the Nevis Island Administration’s (NIA) 9th Annual Consultation on the Economy on September 24, 2015. The event was held at the Nevis Performing Arts Centre under the theme “Framing the new economy: Inspiring Human Progress and Economic Resilience. He said agriculture had its place in what he described as the New Economy, designed to improve the knowledge, skills and service of the island’s human resource. According to Mr. Amory, there is a shift away from the traditional method of agriculture to the modern technological Green House method and investments have been made in this method based on its efficiency and increased productivity resulting in greater output yields. He also mentioned that, to date, green house technology has been introduced at both the government owned Secondary Schools. However, there are existing issues regarding the management process, a matter which the Administration is seeking to upgrade. Mr. Amory indicated that there is evidence that greenhouse agriculture has already been implemented by some in the agriculture sector on Nevis.